SINGLE PHOSPHOR OR NICKEL ROUND WOUND BALL-END STRINGS. 34 - 44. MADE IN BRITAIN. ALL SET BY ROBERT WHITE. 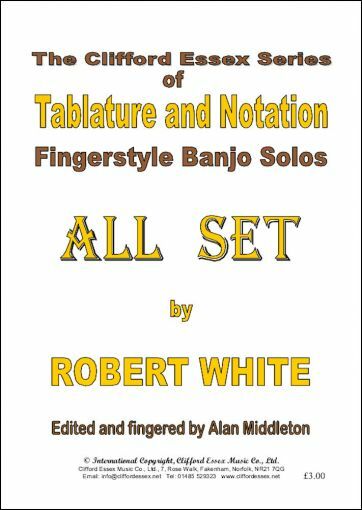 Location: /Sheet music/Fingerstyle Banjo/ALL SET BY ROBERT WHITE. This tuneful solo written by Robert White is almost a Rondo. 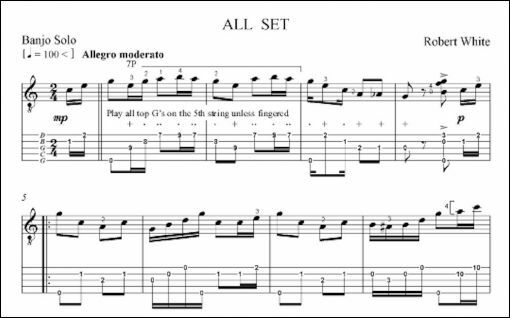 Starting with the usual short Introduction and ending with a similar short Coda, he juggles four phrases in the keys of C major, A minor, F major and D minor to make a very attractive solo. The first phrase crops up a number of times, usually marked piano or pianissimo which is a good way of making an audience listen more closely. The piece should be played at a brisk tempo (the original is marked Allegro moderato, which is not very helpful) so a suggested tempo of a crotchet to 100 is shown, with an indication that it could be faster. The important thing is to observe the dynamic markings very carefully.